Photos by Abbi Hoiles Gee. See more of her photos of Eberly's here. Every fall growing up, my family would drive out to Eberly's Orchard (previously blogged about when by friends Abbi and Michael made a visit with my parents a few years ago), near my grandparents' house in North Liberty, Indiana. Don Eberly, who still runs the orchard, but on a more limited scale, is a local hero former-school bus driver and a farmer, with a penchant for puns and folksy sayings. 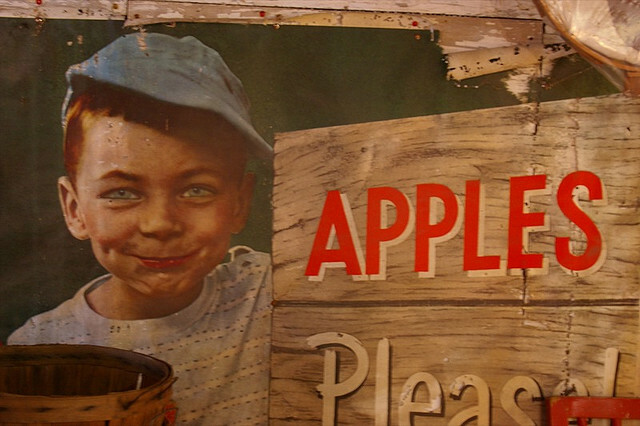 His apple barn is full of bags of apple varieties (including some heirloom varieties, like Northern Spies), folk art and handwritten signs with witty political messages and jokes. As I recall, there were old metal toy tractors for kids to ride on, and bins of gourds and pumpkins. My favorite part though, aside from using the straight wooden ladder to reach the high-hanging fruit, was probably watching the apples go through the cider press, and tasting a sample, which Don would give us, straight from the spout. Eberly's is still my favorite orchard, hands down, even after my time in Vermont-- land of apples. In keeping with our family tradition, my mom, grandma and aunt went out to Eberly's last weekend to pick apples and share stories of the old North Liberty days. This is my grandma Georgette, talking to Don at his cash register. 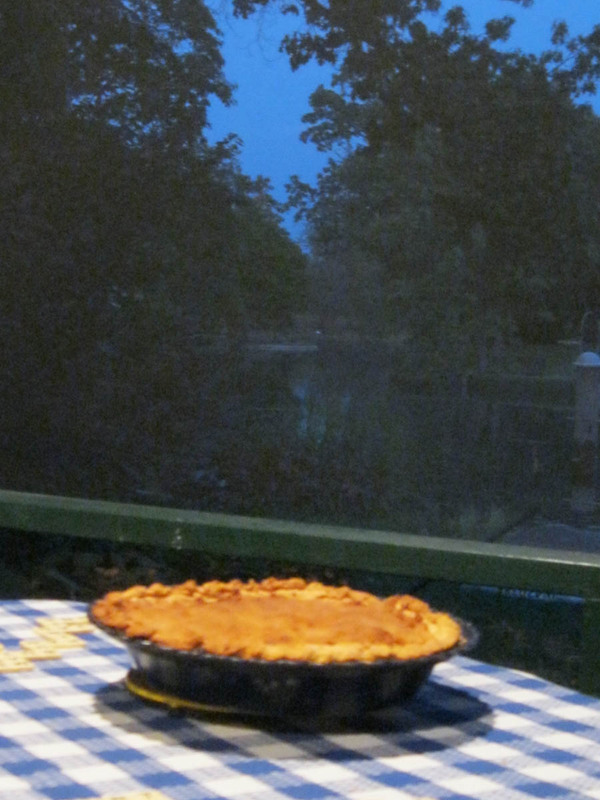 My mom made a pie from Eberly's apples they collected on this trip. 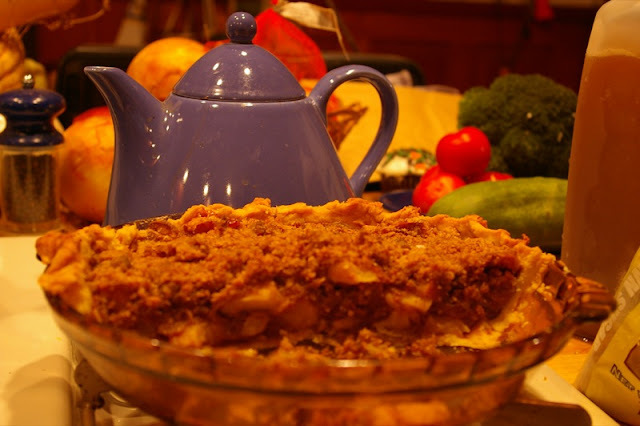 Her apple pies always have the most delicious crumb topping. I've never tried to replicate it, because I'd always just rather eat hers. I like that quote on the note pad. 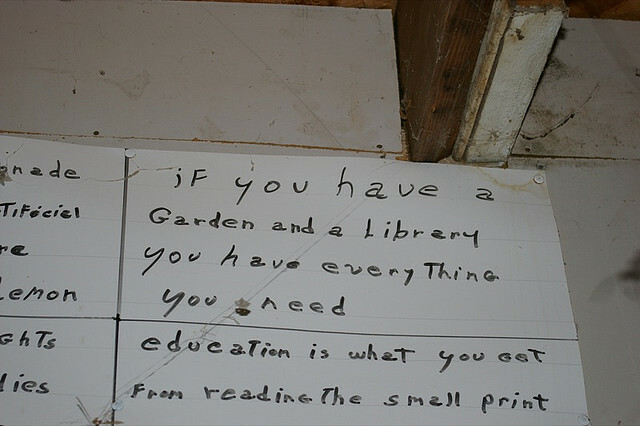 It is true; though I don't have a garden. Hi! I came across your blog doing a search for Eberly's Orchard. I grew up in Walkerton and every fall we'd pick up a bag of apples and a couple jugs of apple cider from Mr. Eberly. Unfortunately, 2011 was the last year for his orchard and it will no longer be open to the public. :-( I will certainly miss his cider and apples. Thanks so much for writing! I LOVED Eberly's and would pick there every fall as well. It is still my favorite orchard in the world. I will certainly miss it as well. Sadly, Mr. Eberly passed away on Saturday. He will be missed by many. So sorry to hear that! He was such a joyful person.